Note: Isn't this an nice overhead shot of the room? Top of the picture: Hiroshi Uchiyamada facing all the teachers. This is where the teachers hang out when they are not teaching class. While they use the time to grade tests or to converse with one another, there is always never a dull moment in the school... as there might be something going on as we speak. Listed below are the fine faculty members here at Holy Forest Academy, and some information (BASIC AND SLIGHT SPOILER!) Please proceed with caution! YOU HAVE BEEN WARNED!!! This particular section was last updated on: February 5, 2007. **Note listings below ARE NOT in alphabetical order. Plus the faculty 'guide' can change at any time!!! Education: Attended Eurasia College. Was captain of the school's karate team. -Supposed knowledge in dancing^, singing^^, poetry^, and limbo^. Onizuka is one of the most interesting anime characters that I've come across to in my years of watching anime. A former member of a biker gang (and being the legendary 'Onibaku'), Onizuka decides to get into teaching after a run in with a girl (Manga Volume 1), and it was a struggle to first make it as a student teacher. Once making it past that obstacle, he made it into Holy Forest Academy after missing out on a test to get qualified to teach in public schools. After nearly blowing his chances, Onizuka gets the job of teaching. Unfortunately he gets the troublesome class 3-4 to deal with, and from there... things in the school have been very interesting! Onizuka is a virgin, and the majority of the time he's thinking about women. He takes into consideration many factors, such as age, bust size, looks, etc. Sometimes his pervertic tendacies can get him into trouble, and this just adds to the humor aspect of the series (while of course raising the recommended viewing age for the anime/manga). In the manga, an event happens which explains why he got into teaching in the first place. This event involved a girl and a teacher.... He's also a man of many costumes, many ideas, many thoughts. Sometimes the man has great hearing. Even Onizuka can pick up on things that are a bit quieter than usual or are far away. Usually you know his super hearing is working when his ear is larger than usual. While he can pick up on conversation in this matter, what he does with it or how he interprets it is a totally different matter. Plus he has a tendacy to have sloppy handwriting and even misspell things. The man playing Onizuka for the English dubbed version is Steve Blum (listed in the credits using the David Lucas name some of us are more familiar with). Playing such roles such as 'Spike' from 'Cowboy Bebop', and 'Makoto Shishio' from 'Rurouni Kenshin,' I think he fits the character well. Onizuka projects himself to be a tough guy who isn't afraid when the time gets rough, plus can show that he does care and that he can get emotional as well. Seems like a pretty much perfect match. >>The American Release of the GTO Anime Series has some extras. One of them is an interview with GTO Creator Tohru Fujisawa (4 parts of it over 4 DVD releases). Onizuka's name does indeed come from Eikichi Yazawa. Also part of the creator can be found in Onizuka. ^^=Anime Volume 5-Lesson 21 -AND- Manga Volume 7-Lesson 53. **No mention (anime or Manga) if Fuyutsuki had ever been a homeroom teacher for any other class. She met Onizuka enroute to the interview... unfortunately they had to meet under strange circumstances... as she was being targeted by a old, bald, perverted man (who later turned out to be Uchiyamada). Since then, Fuyutsuki and Onizuka became friends. Sure they argued every now and then, they still looked to each other when the times were rough. Fuyutsuki is the type of person who often follows the rules... conservative, but is also courageous and bold at times. In the anime version, Azusa decided to become a teacher while spending time with a friend in Hokuba who was one. She liked it so much, that well the rest is history. In the manga, she was also inspired by a teacher, but the circumstances were slightly different (almost touching upon the live-action drama version). Could Fuyutsuki and Onizuka be a item? The potential exists... those she still freaks out on occasion on some of the things Onizuka does (perverted or not). Though actually some of the things that he does gives her the inspiration and couarge to try to become a better teacher. Because of the exclusion of certain characters and/or events in anime (when compared to the manga), Miss Fuyutsuki's role differs greatly-in ways that make the anime and manga each equally unique. For the English dub, we have a great voice actress playing Fuyutsuki (amongst others). Wendee Lee is the actress giving Miss Fuyutsuki the kind and gentle voice. Wendee has played many roles throughout many series, two the more familiar ones would be 'Faye Valentine' from 'Cowboy Bebop' and 'Twlight Suzuka' from 'Outlaw Star.' Believe me... it's the same actresses... being able to do voices ranging from young to old... male to female... is truly amazing. One of the (vice-) principals/ head administrators at the school. In volume 17 of the manga, it was made official that he was the administrative principal. He held the position until an incident forced him to go to the hospital. This man looks very similar to Vice Principal Uchiyamada... so it can be very hard to tell them apart. One of the major differences is that Xavier tends to wear white/light colored suits, while Uchiyamada tends to wear black/dark colors. He tries his best to try to contain things after certain Onizuka related events occur. As a result, he has a dislike to Onizuka, but not as severe at the other teachers. Despite his position, his work is often 'carried out' by either Mrs. Sakurai or by Uchiyamada. The man supposedly had diabetes... but whether or not it 'convienently' helped put him into the hospital at a crucial point in Volume 17 remains a mystery (only to return in Volume 18 just at the 'right' time). Principal... head administrator... make up your mind Tokyopop!!! Position: The chairman at Holy Forest. It's 'chairman' despite the fact that she's a woman. It would make better sense IF she were often referred to as 'chairwoman,' but that's NOT the case most of the time. By the time the 14th volume of the manga comes around, Mrs. Sakurai is convinced still that Onizuka is what the school needs, not bowing down to pressure from Uchiyamada or concerns from her assistant Itagaki. She (still) does care about the school and the students that are in it. This especially holds true to her grandson Wakui, who's return to Holy Forest isn't some miracle in progress... Knowing everything still, Mrs. Sakurai believes Onizuka can help him. As it seems Daimon and Sakurai have had some sort of past... teacher and student... It's never too late to learn... and grow. Assistant for one Mrs. Sakurai. Itagaki questioned her decision to hire Onizuka. His role is much more signficant in the manga version. Is he loyal to Mrs. Sakurai or is he really with the corrupt school board? He plays his role very well, everything that he was doing finally revealed in Volume 24 of the Manga. Yeah, appearance and actions CAN BE deceiving. Position: In the anime, he is the 'sole' vice-principal, while in the manga, he shares the title and some of the responsibilities with the other (vice) principals. The jobs 'Principal' and 'Vice Principal' are used often interchangably to describe his position. He and Onizuka become bitter enemies the minute Onizuka prevented him from doing anymore perverted things to Fuyutsuki on the bus. With really bad things happening to the school, and to himself, Uchiyamada has made it a priority to get Onizuka out of the school as soon as possible, and in any (legal) way possible. Uchiyamada is a bigger pervert in the manga, and this comes into significance a few times. He is married, with a wife Ryoko, and a daughter Yoshiko. His family life is crumbling... and part of that is his fault (it is when you spend little to no time daily at your home). While his wife and daughter may sometimes think less of him, the family dog is even worst! To attempt to win back their love, he purchaes a Toyota Cresta (a real life car... sold only in Japan), believing in the commercial's claims. Ah unfortunately life can be so cruel... as the car will go through some 'problems' of its own... I loved the moments with the Cresta... both in the anime and manga. The infamous Toyota Cresta (manga version), a nice BEFORE shot. Teaches: Social Studies and Physics He's kinda of a renaissance type of guy! One of the few teachers that Onizuka has befriended/ hasn't made enemies of. Very much a minor supporting character, who does things every now and then to contribute to the story. Other position: Head teacher or advisor for the entire Year 3 class. That means that he's involved with certain affairs (like test scores, trips, class activities for example) as it relates to the entire Year 3 students, which includes Class 3-4. Sakurai started at Holy Forest when he was 24. He is not married to or related to Ryoko Sakurai in any way. The last name is different in the anime because it is a way to avoid this confusion. He is actually quite married with a wife and child of his own. Manga difference: One of his hobbies will come into play... allowing Aizawa to take advantage of it (via Blackmail) in her attempts to get rid of Onizuka. If you think about it, this hobby is just downright disgusting (which started when he was 14)... believe me... I certainly hope no teachers are THIS BAD in real life... If you think he was bad before, then read on in the manga. This guy is simply too much. Anime difference: Something he did BEFORE becoming a teacher allows Aizawa to take advantage of him (via Blackmail) in her attempts to get rid of Onizuka. (Keep in mind that television and books have different standards/rules. SOME THINGS HAD TO BE CHANGED FROM the manga TO the anime.) Indeed... his 'past life' is indeed embrassing... and I don't blame him for trying to cover it up. Just as long as THAT was the ONLY thing he did. DEFINITELY tamer than the manga. **In the anime; english dubbed version, Sakurada teaches Astronomy. It wouldn't sound right hearing in English if Sakurada teaches 'English.' (the language NOT literature) While it feels like butchering (to the many anime purists/otakus who feel this way), I felt this is a needed change... that and the corresponding scene (after Kanzaki busts him on his English) is funny. Although an acceptable alternate subject could have been 'ADVANCED ENGLISH,' 'ENGLISH LITERATURE TAUGHT IN ENGLISH,' and heck even 'JAPANESE (language).' It wouldn't have sounded right... think about it. In the english subbed version (and the manga), he still teaches English (language) though. Note throughout Sakurai's scenes BEYOND Volume 9, certain words that he pronounces/says in English are surrounded in parentheses/quotation marks. This is to show that the 'dialogue' throughout the series is spoken in Japanese, with Sakurai trying to incorporate English into his dialogue (quite badly). The words/paratheses are misspelled on purpose... if you say the word/phrase exactly as it appears, then you have an idea of how he tried to said it (badly). He only started hating Onizuka (to a point) after he did something to provoke it. In the anime, it was a bottle rocket right in the kisser. In the manga, it was sending Koji Fujiyoshi flying down on a bungee... with a near collision with the PE Teacher. People call him 'Mole Face' because of the mole near his mouth. Tries to teach Onizuka a lesson by challenging him in a swimming race (anime & manga) and a 400m dash event (manga only). Very much a pervert-enjoys seeing girls running in tight gym shorts. Also was accidentally used by Miyabi in both versions, but the events were very different... but the eventual outcome was the same... Onizuka made to look like the hero... of sorts. Perverted? Well he does take advantage of having the chance to teach girls in phys ed... Plus he does have a (minute) crush on Fuyutsuki. Firm believer of the school rules and philiosophy... tries to enforce it whenever he gets a chance. **If you look carefully in Volume 3, on the page in Lesson 16 where we get to see the LARGE photo of Onizuka on the wooden horse, the person next to Miss Moritaka looks like him. Debatable whether is it truly him. Interests: Trying to find a wife. Apparently spends a lot of time and money doing this. He resembles a Chihuahua... and thus its his nickname. Was a target of Kanzaki's classroom terrorism because the teacher wasn't quite aware of what was going on in the classroom. 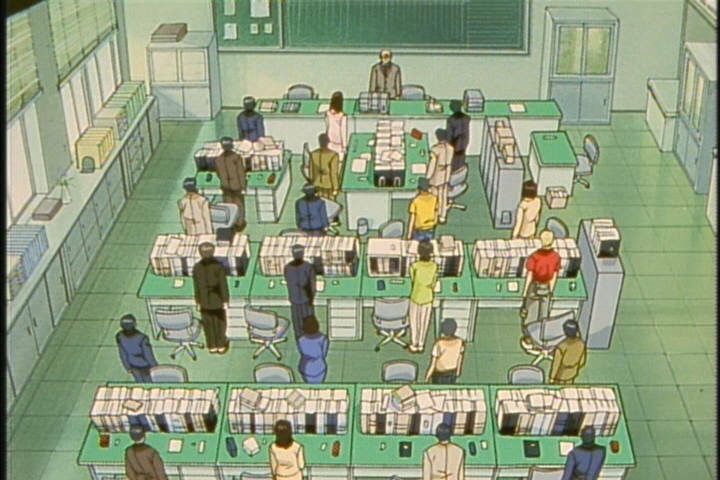 Only dislikes Onizuka because of his disregard for the scientific equipment. Sometimes shudders in his speech. -Finished tenth in the national entrance exam to get into Tokyo University at the time. -Once known as the "Queen of Hakosuka." She is an anime only character, replacing one Naoko Moritaka. Either the decision was made to avoid two different character personalities of the same character, or they just wanted a cooler, anime-only exclusive character. Either way, Nao is just as attractive as Miss Moritaka in the manga, but Nao is a bit racier and has a storyline of her own to contribute to the series. Luckliy for us that she'll still be around in the remaining portion of the anime (unlike one Teshigawara). Nao is one the few teachers that (immediately) got a lesson taught by the great Onizuka. Miss Kadena tries to help Miss Fuyutsuki out when the time arises... on two separate occasions. Heh... the 'Call me Nao' are rather funny... catchy... and can get tiring after a while (and all the other 'Now' puns). In the anime, since she wasn't introduced until halfway through the series, who's been acting at as the nurse? Note (2/2007): Nao Kadena makes an appearance (or more appropriately first appears) in "Shonan Junai Gumi" the manga series that took place BEFORE "Great Teacher Onizuka." From what I've read on the Wikipedia entry, the Nao Kadena event/story arc in the GTO anime was adapted from her apperances/events in the "Shonan Junai Gumi" manga. Position: Headmaster... ur Headmistress of Holy Forest Academy... as of Volume 19/20 of the manga. -She's the second adminstrator at the Holy Forest with a mole, at the right side (her left) of her face. Fukuroda was the first. Not does she have an agenda of ridding Holy Forest of Onizuka, she has her sights/targets on kindly Mrs. Sakurai... for personal reasons. Like most of the incidents in GTO, someone has something against a teacher for something that has happened (in the past), and Daimon has that right here. The reasons why she was brought over to Holy Forest and her 'style' / 'philosophy' of running a school/reforming it gets revealed in Manga Volume 24.